The report examines challenges to scientific integrity facing the research enterprise and recommends steps that individual scientists, research sponsors, research institutions, journal publishers, and professional societies should take to meet these challenges and better protect integrity in research. 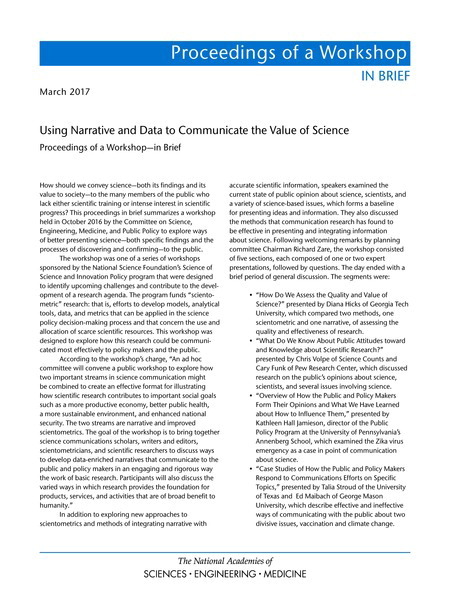 This workshop summary discusses how to merge the insights of expert judgment and newly available quantitative data and present them in engaging narratives that will capture the interest of policymakers and the public. Workshop participants discussed ways to develop data-enriched narratives that communicate to the public and policy makers in an engaging and rigorous way the work of basic research. They also explored the varied ways in which research provides the foundation for products, services, and activities that are of broad benefit to humanity. Building on the ground-breaking 2000 report Enhancing the Postdoctoral Experience for Scientists and Engineers, this book explores important changes that have occurred in postdoctoral practices and the research ecosystem and assesses how well current practices meet the needs of these fledgling scientists and engineers and of the research enterprise. 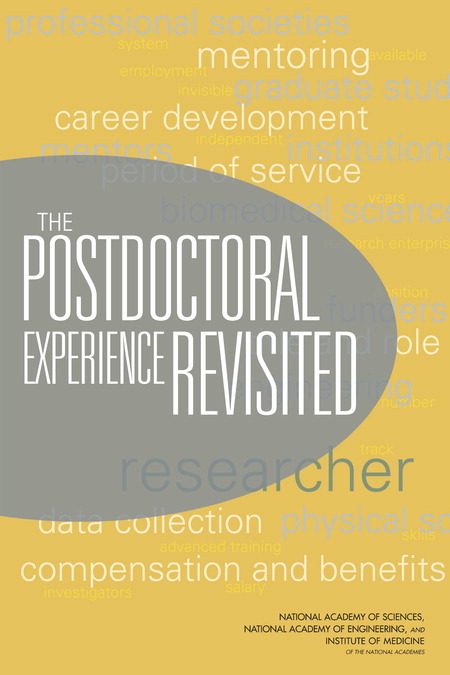 The Postdoctoral Experience Revisited makes recommendations to improve aspects of programs - postdoctoral period of service, title and role, career development, compensation and benefits, mentoring, and better data collection and sharing by research institution. The discussion and recommendations of The Postdoctoral Experience Revisited will stimulate action toward clarifying the role of postdoctoral researchers and improving their status and experience. America's research universities have undergone striking change in recent decades, as have many aspects of the society that surrounds them. This change has important implications for the heart of every university: the faculty. To sustain their high level of intellectual excellence and their success in preparing young people for the various roles they will play in society, universities need to be aware of how evolving conditions - such as gender roles, family life, the demographic makeup of the nation and the faculty, and the economic stability of higher education - affect their ability to attract the most qualified people and to maximize their effectiveness as teachers and researchers. 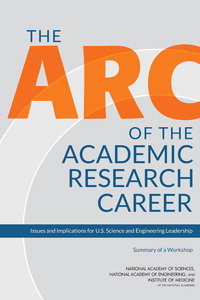 The Arc of the Academic Research Career is the summary of a workshop convened in September 2013 to examine major points of strain in academic research careers from the point of view of both the faculty members and the institutions. This workshop summary addresses the challenges universities face, from nurturing the talent of future faculty members to managing their progress through all the stages of their careers to finding the best use of their skills as their work winds down. 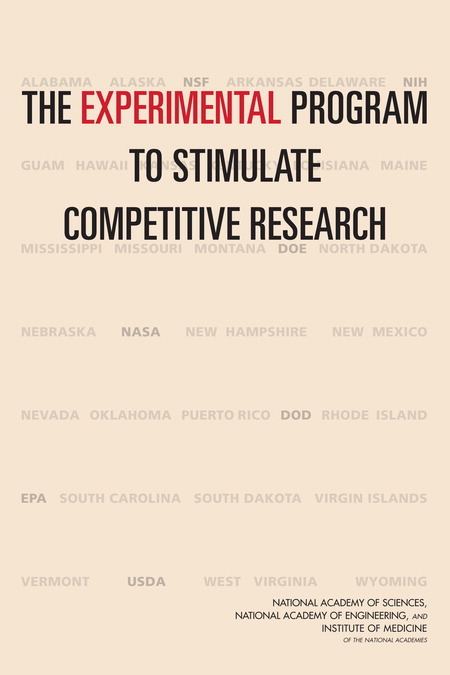 The primary federal program designed to ensure that all states are capable of participating the nation's research enterprise fall under the general rubric of the Experimental Program to Stimulate Competitive Research (EPSCOR). The National Science Foundation (NSF), Department of Energy, Department of Agriculture, and National Aeronautics and Space Administration have active EPSCOR programs. Since its inaugural year in 1979, the EPSCOR program has grown from funding programs in five states to awarding funding to 31 states in 2012. The Experimental Program to Stimulate Competitive Research assesses the effectiveness of EPSCOR and similar federal agency programs in improving national research capabilities, promoting an equitable distribution of research funding, and integrating their efforts with other initiatives designed to strengthen the nation's research capacity. This report also looks at the effectiveness of EPSCOR states in using awards to develop science engineering research and education, as well a science and engineering infrastructure within their state. The Experimental Program to Stimulate Competitive Research makes recommendations for improvement for each agency to create a more focused program with greater impact. Innovation has been a major engine of American economic and societal progress. It has increased per capita income more than sevenfold since the 19th century, has added three decades to the average lifespan, has revolutionized the way we communicate and share information, and has made the United States the strongest military power in the world. Without its historical leadership in innovation, the United States would be a very different country than it is today. 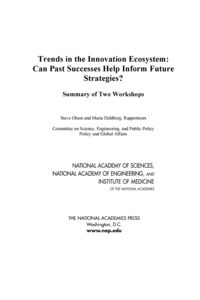 Trends in the Innovation Ecosystem is the summary of two workshops ﻿convened in February and May, 2013. Experts from industry, academia, and finance met to discuss the challenges involved in innovation pathways. Both workshops focused on the interactions between research universities and industry and the concept of innovation as a "culture" as opposed to an operational method. The goal was to gain a better understanding of what key factors contributed to successful innovations in the past, how today's environment might necessitate changes in strategy, and what changes are likely to occur in the future in the context of a global innovation ecosystem. This report discusses the state of innovation in America, obstacles to both innovation and to reaping the benefits of innovation, and ways of overcoming those obstacles. With the increasing frequency of natural and human-induced disasters and the increasing magnitude of their consequences, a clear need exists for governments and communities to become more resilient. The National Research Council's 2012 report Disaster Resilience: A National Imperative addressed the importance of resilience, discussed different challenges and approaches for building resilience, and outlined steps for implementing resilience efforts in communities and within government. 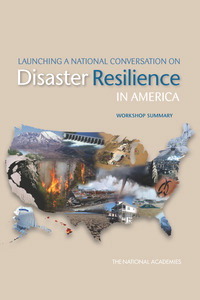 Launching a National Conversation on Disaster Resilience in America is a summary of a one-day event in November 2012 to formally launch a national conversation on resilience. Nationally-recognized experts in disaster resilience met to discuss developing a culture of resilience, implementing resilience, and understanding federal perspectives about resilience. This report includes a broad range of perspectives and experiences derived from many types of hazards and disasters in all parts of the country. No person or place is immune from disasters or disaster-related losses; statistics for 2011 alone indicate economic damages from natural disasters in the United States exceeded $55 billion, with 14 events costing more than a billion dollars in damages each. Disaster Resilience: A National Imperative addresses the broad issue of increasing the nation's resilience to disasters. This book defines "national resilience", describes the state of knowledge about resilience to hazards and disasters, and frames the main issues related to increasing resilience in the United States. It provides goals, baseline conditions, or performance metrics for national resilience; outlines additional information, data, gaps, and/or obstacles that need to be addressed to increase the nation's resilience to disasters; and the book's authoring committee makes recommendations about the necessary approaches to elevate national resilience to disasters in the United States. Inspired by Rising Above the Gathering Storm: Energizing and Employing America for a Brighter Economic Future (2005) and Rising Above the Gathering Storm, Revisited: Rapidly Approaching Category 5 (2010), the ability of the states to drive innovation was the impetus behind a major workshop held in Madison, Wisconsin, on September 20-22, 2011. The workshop brought together leaders in education, government, economic development, and industrial innovation to discuss state and regional initiatives to boost competitiveness through science, technology, and innovation. The conference was organized around four major themes: 1) Revitalizing K-12 Science and Mathematics Education; 2) Strengthening Undergraduate Education in Science and Engineering; 3) Building Effective Partnerships Among Governments, Universities, Companies, and Other Stakeholders; and 4) Fostering Regional Technology Development and Entrepreneurship. Rising Above the Gathering Storm: Developing Regional Innovation Environments: A Workshop Summary gives an overview of the presentations, observations, and recommendations made during the workshop. natural and human-induced disasters on the Gulf Coast of Louisiana and Mississippi and to learn more about the resilience of those areas to future disasters. Topics explored ranged from insurance, building codes, and critical infrastructure to private-sector issues, public health, nongovernmental organizations and governance. This workshop summary provides a rich foundation of information to help increase the nation's resilience through actionable recommendations and guidance on the best approaches to reduce adverse impacts from hazards and disasters. On April 18-19, 2011, the Board on Science, Technology, and Economic Policy (STEP) and the Committee on Science, Engineering and Public Policy (COSEPUP), held a workshop to examine a question that has been asked for decades: Can the impacts and practical benefits of research to society be measured either quantitatively or qualitatively? Motivated by a 2009 letter from Congressman Rush Holt (D-New Jersey) the workshop investigated issues such as the short-term and long-term economic and non-economic impact of federal research funding, factors that determine whether federally funded research discoveries result in economic benefits, and quantification of the impacts of research on national security, the environment, health, education, public welfare, and decision making. Measuring the Impacts of Federal Investments in Research provides the key observations and suggestions made by the speakers at the workshop and during the discussions that followed the formal presentations. Expanding Underrepresented Minority Participation explores the role of diversity in the science, technology, engineering and mathematics (STEM) workforce and its value in keeping America innovative and competitive. According to the book, the U.S. labor market is projected to grow faster in science and engineering than in any other sector in the coming years, making minority participation in STEM education at all levels a national priority. Although minorities are the fastest growing segment of the population, they are underrepresented in the fields of science and engineering. Expanding Underrepresented Minority Participation suggests that the federal government, industry, and post-secondary institutions work collaboratively with K-12 schools and school systems to increase minority access to and demand for post-secondary STEM education and technical training. 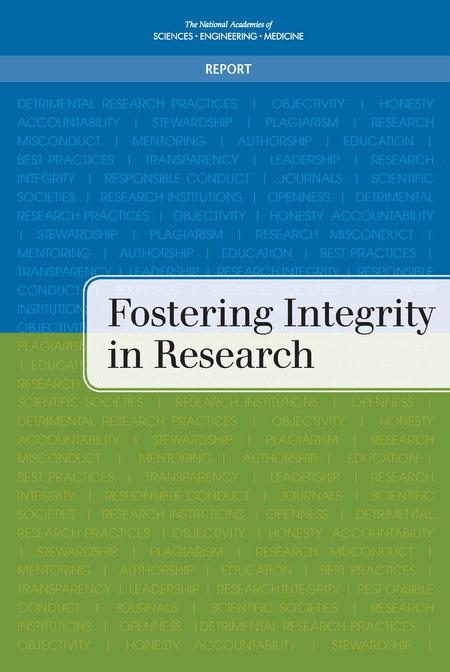 Ensuring the Integrity, Accessibility, and Stewardship of Research Data in the Digital Age examines the consequences of the changes affecting research data with respect to three issues - integrity, accessibility, and stewardship - and finds a need for a new approach to the design and the management of research projects. The report recommends that all researchers receive appropriate training in the management of research data, and calls on researchers to make all research data, methods, and other information underlying results publicly accessible in a timely manner. The book also sees the stewardship of research data as a critical long-term task for the research enterprise and its stakeholders. Individual researchers, research institutions, research sponsors, professional societies, and journals involved in scientific, engineering, and medical research will find this book an essential guide to the principles affecting research data in the digital age. This third edition of On Being a Scientist reflects developments since the publication of the original edition in 1989 and a second edition in 1995. A continuing feature of this edition is the inclusion of a number of hypothetical scenarios offering guidance in thinking about and discussing these scenarios. On Being a Scientist is aimed primarily at graduate students and beginning researchers, but its lessons apply to all scientists at all stages of their scientific careers. Rising Above the Gathering Storm Two Years Later: Accelerating Progress Toward a Brighter Economic Future summarizes a convocation held in April 2008 to commemorate the release of the original Gathering Storm report. The convocation featured participation by Members of Congress, Cabinet Secretaries, leaders from industry and academia, and other experts. The discussions reviewed progress made thus far in implementing the Gathering Storm recommendations to strengthen K-12 education in math and science, research, higher education, and the environment for innovation. Participants also noted that much additional work is needed to ensure that America remains a leader in science and engineering in the long term.